�ｻｿWedding Ministers at Bridal Dream Hawaii. 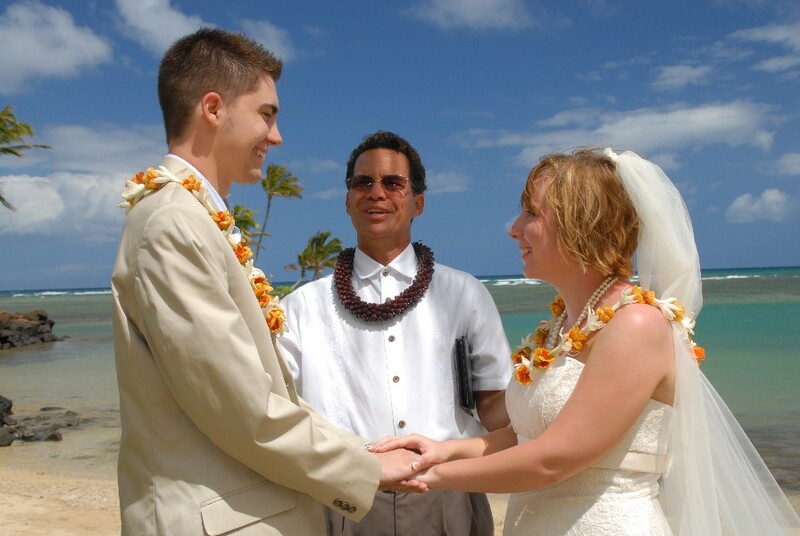 Our Wedding Ministers at Bridal Dream Wedding Company are available for Weddings around the island of Oahu. We are happy to have Minister Kimo Taylor as our full-time Wedding Minister. Rev. Kimo does a prayer in Hawaiian during the Wedding Ceremony. He is a member of Hope Chapel. Kimo performs a non-denominational Christian Wedding ceremony. A non-religious ceremony is also available. 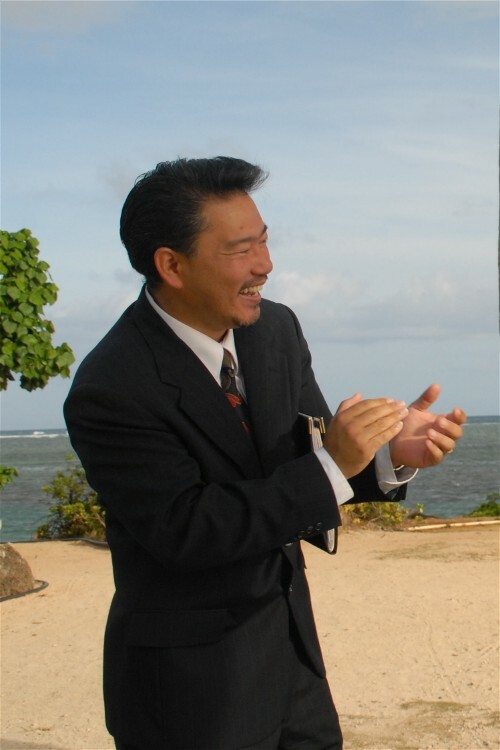 Pastor John Fuchigami is the senior Pastor at HOPE CHAPEL ALA MOANA. A gentle personality and a good-hearted laugh. Great guitar player, too! Rev. Chris Cain has a gentle personality that makes him well-suited for working with Wedding couples. He is also very good at Japanese. 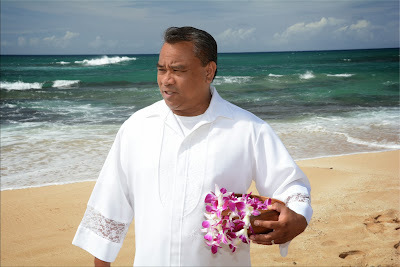 We highly recommend this Minister for your Wedding in Hawaii. "Pastor Jofrey was everything we could have wished for! We are so pleased with how our wedding turned out, and the officiant really has the power to make it or break it. Pastor Jofrey was genuine and sincere, funny but sentimental, and really gave us some precious pearls of wisdom during our ceremony. Can't recommend him enough. You won't be disappointed by Pastor Jofrey." We really like Rev. Bob's wedding style with a smooth and polished wedding ceremony that suits a Minister with years of experience. Rev. Bob lives in Ewa Beach and is a Minister on the North Shore at Turtle Bay Chapel and at a "Once a Month" Church meeting at Haleiwa Beach Park. Most of our Wedding Ministers have a non-denominational Christian ceremony. Please let us know if you wish to have a Non-Religious Ceremony. You may also write your own wedding vows. The Minister is happy to make room for you in the ceremony to read those to one another. We may add $40.00 to your Wedding Package if you would like a custom Ceremony that is significantly different from our standard wedding ceremonies. Our usual Wedding Ministers perform Christian Weddings with a desire to inspire and bless you spiritually. If you prefer a non-religious Ceremony (without any references to God or Jesus), we can find another Officiant for you. Please add $40.00 to your Wedding package if you request a non-religious (civil) Wedding. *Please note that, according to Hawaii law, all Weddings performed by a Minister or Officiant are considered "Religious" regardless of whether there are references to God or not, and Weddings performed by a Judge are "Civil". 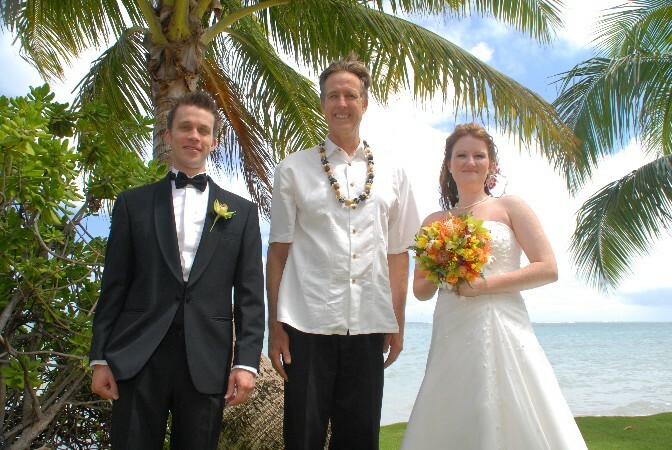 Bridal Dream Wedding Company organizes Weddings in Honolulu, Hawaii on the island of Oahu. You can order Bridal Flowers, Hawaiian Music, Christian Minister, Professional Photography and Limousine Service. 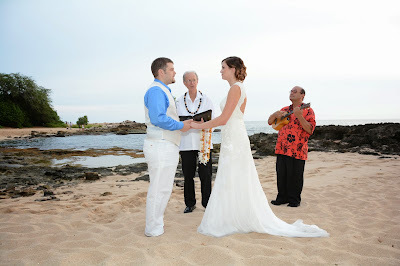 Check BridalDreamHawaii.com for Hawaii Wedding Packages.